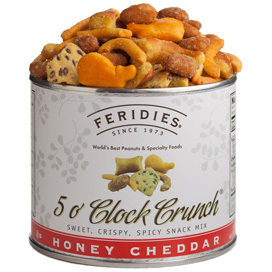 A favorite among the FERIDIES® staff and our customers, 5 O'Clock Crunch® quickly disappears every time it is served. 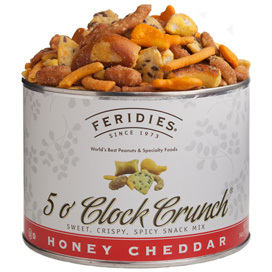 This yummy snack mix in re-sealable 2.5 oz. 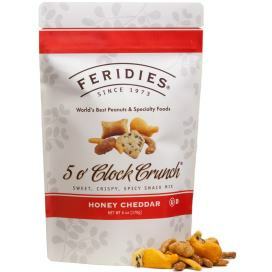 bags includes honey roasted Virginia peanuts, cheddar cheese crackers, chili-lemon corn sticks, honey roasted sesame sticks, honey mustard pretzel sticks and salted corn chips with flax seed. Shelf life is approximately 6 months. Bag measures 4"L x 6.5"H. OU Dairy Kosher Certified. $2.95 per bag.